Join Conroy's Pub for a totally awesome 80’s themed party on Friday, May 15th starting at 8pm. 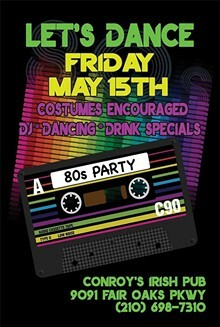 We’ll have a DJ spinning the best of the 80’s, disco balls, dancing & more. Costumes Encouraged.